Exciting news! 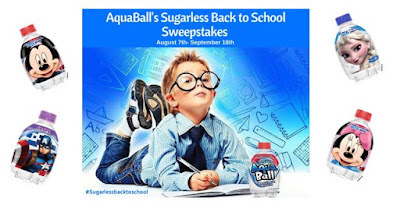 Beloved children's beverage brand AquaBall is hosting a Sugarless Back to School Sweepstakes with awesome prizes just in time for back-to-school season. AquaBall is the only zero-calorie, sugar-free and preservative-free children's beverage currently on the market. The naturally flavored water is available in four flavors – Berry Frost, Fruit Punch, Grape, and Strawberry Lemonade – and features fan favorite characters from Disney's "Frozen", Disney Princesses, Marvel's "Avengers," and Disney Classic Characters. Callan loves AquaBall. And so does Mama, shhhh. He wonders sometimes why one went missing! Hee hee. They are really very tasty and the perfect size for on the go (plus they fit in some lunchboxes!). A huge hit in our household!